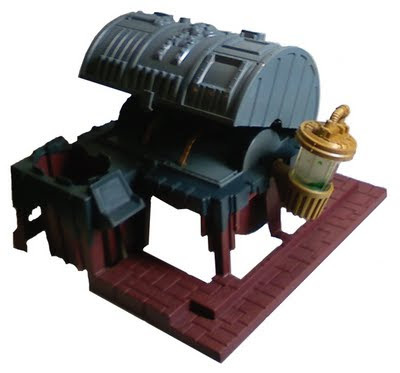 Taylor's Sweet Little Art and Nerd Site: Taylor's Toy Box Entry: Kenner's Swamp Thing Transducer Playset: Great Finds and the Inevitable Curse that Follows Them. 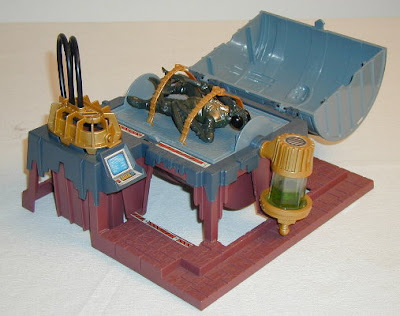 Taylor's Toy Box Entry: Kenner's Swamp Thing Transducer Playset: Great Finds and the Inevitable Curse that Follows Them. Let me just start off by saying that toy collecting is a hobby of mine. It should be for most people, but there are some who have the time and resources to make toy collecting and trade a working business. So, with that being said, when I talk about toy collecting, for the most part I am approaching the subject as a hobby collector. Depending on what you find and what is missing can be a collectors ultimate nightmare! Take for example, I collect some of the waves of Mattel's DC Classics. Wave three features a build a figure of Desparo ( a REALLY cool version of Desparo). I was able to get all of the characters in that wave except for the ever hard to find and rather expensive Wonder Woman (sad trombone). So in order to complete the BOF of Wave 3, I have to spend way out of my comfort zone for a toy. Instead after two years of looking, I was able to find just the leg that a nice person was selling on ebay. Thus, Desparo is now complete. But, not all collection pieces end in such a radtastic way. Take as another example, my vintage castle Grayskull will probably never be complete, and if I do muster up enough money to replace broken and missing pieces, it will probably get expensive seeing that the vintage Masters of the Universe toyline is no longer in production. The fact that its 30th anniversary is in 2012 is not encouraging either, being that once MOTU's popularity skyrockets again, some vendors can sell their pieces at astronomical prices. So the ability to finish pieces comes down to it's popularity and production. A piece like Kenner's Swamp Thing Transducer is pretty hard to come by. It was not very popular and was short lived. I have only seen a few complete playsets, all boxed, for sell on collector's sites and amazon. All boxed sets ranging in the fifty to one hundred dollar range. So far no single pieces or opened sets are for sale. Does this mean that I should be discouraged; no. I try not to look at aspects of collecting as a curse. For me, I like to think of collecting as a puzzle that should never have a solution. Some of the fun of collecting vintage toys is that I like looking for these pieces and finding the best deals available. I believe that collecting in this way gives one a reason to boast and be proud of their collection. This way makes you work for what you have. To me that's a good way to look at collecting, but for everyone else who sees the inability of completing a set quickly as a curse, then yes, it is a curse. Hey! I just got a transducer today! Stumbled on this site by chance. Mine too is incomplete, missing those black hoses. The thing is, those hoses seem to be the only thing that holds the gold piece they attach to in place. Without it, that piece just loosely sits there. I have an extra mantis, and I plan on trying to re-do the stickers. If you're interested let me know. I figured that I would touch base with you. I still have had no luck finding a sticker sheet online. Are you still photoshopping a decal sheet? Definitely Dude! I'm still looking around to see if anyone has a scan of the original sticker sheet. If I come across it, I'll post the link to that info here on this blog. Also, I think I might have an alternative to the black hoses that will work fine. I just need to look into it first to make sure that it will work. I'll keep you updated! I was goint to try to peel all of my stickers, scan them, clean them up in photoshop, then reprint them on sticker paper. The previous owner of mine did a hack job on the sticker placement (probably a kid), and in addition to that age has not been kind to the adhesive and several of them just plain fell off. If you can find a scan of the sheet though, that would save me a bunch of trouble. And let me know what you find out about those hoses. Ok, so I did some more research and this is what I came up with. The gold helmet topper, the gold piece that the hoses connect to, has an armature that sits under it. It is gold as well. I believe that is where the large bug heads from Adam Arcane and his cronies goes. Now the black hoses are easily replaceable. I don't have the gold piece so I wasn't able to check the size, but the black hoses that Kenner used back in the day, and what Hasbro uses now is this. A hobby coolant hose. Above is a link to a hobby store that carries it. As far as the decals, no dice.